One of the most exciting opportunities of my blogging journey has been partnering with Lion Brand Yarn, a very well-respected and well-known yarn company! When I first started blogging, I always wondered whether yarn companies would eventually partner with bloggers as I saw this frequently happen with style and make-up bloggers and big companies. I always loved using their yarn in my early projects when I would scour the aisles of Michaels for the perfect yarn, and I used Vanna’s Choice with my Knotted Headband and Wool-Ease Thick & Quick for my Long Double Crochet Cowl. Their colours and yarns have always been very current and a favourite of many crocheters and knitters with their wide range of materials and yarn weights available. The yhave done such a great job keeping up to date with trends, listening to what consumers are interested in, and evolving as a company with the rise of digital media (their colour-themed Instagram page is beautiful, and they have a very active blog). I was thrilled when they reached out years ago and sent me some samples of new yarns to work with and also involved me in their #Scarfie campaign. 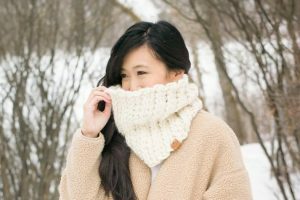 Each blogger designed some sort of scarf with Wool-Ease Thick & Quick and took a selfie wearing that scarf (scarf + selfie = scarfie), and I designed the Twist Cowl shown below (aww, can’t believe I was pregnant with Brielle during this photoshoot)! For the past two and a half years, I have been designing a new project using their yarn every month, and they have given me great creative freedom as I’ve designed everything from pouches and animal pillows to cardigans and blankets. Some of our collaborations have been turned into handy kits that are available for purchase on the Lion Brand Yarn Website, making it easy to get all the yarn and colours required for certain projects! Some yarns are exclusively available on the Lion Brand website and not available at local craft stores, so it is a neat way to try out new yarns as well! It is very exciting because Lion Brand Yarn has created a landing page devoted to all of the kits that we have collaborated on together! The landing page has my logo, a picture, a short bio, and a link to my blog and social media platforms. 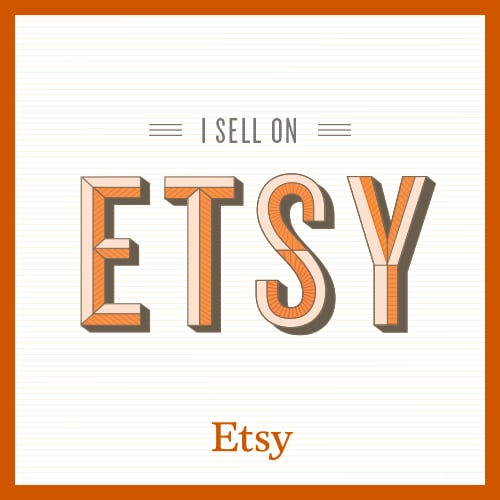 It also lists all the kits (currently 18 of them) making them easy to browse and shop at a glance- click HERE to check out this special page! You’ll notice that at the top of the landing page, there is a YouTube video entitled “Meet All About Ami“! While we were in New York City for the Lion Brand Yarn Blogger Bash a couple of months ago, each blogger was interviewed by Shira and filmed by Sarah, and they put these video clips together to make these fun videos! I tried not to get too nervous as the bright lights were on me and I tried to communicate as clearly as possible (in real life I’m quite a fast speaker haha). I brought my Amigurumi Pineapple Purse, Regency Reticule, and Simple Seed Stitch Headband with me on this trip as my general topic was portable projects. I am also wearing my Cascade Cardigan in the segment! Check out the video below and see what my favourite yarn is! Now let’s take a look at some of the kits that I have designed with Lion Brand Yarn! All three garments of my Granite Series are available as kits: the Granite Cape, Granite Cardigan, and Granite Poncho! The Boho Crochet Wrap and Two-Tone Scarf Wrap are two beautiful wraps that can be worn year-round and can provide that extra warmth needed on chilly nights or on a flight! For kawaii and amigurumi lovers, check out these adorable designs that serve functional purposes as well: Amigurumi Pineapple Purse (you can make two purses with just one kit), Snuggle Bunny Pillows, and Pillowji Pillows (you can make a set of all three faces with one kit)! For Wool-Ease Thick & Quick fans, these two household items add a chic touch and are fun to work up with some new stitches: the Waistcoat Crochet Basket and Cross Bobble Blanket! I love matching hat and scarf sets, and I designed two this past fall/winter: the Braided Cabled Slouchy Beanie & Cowl, and the Snow Puff Ribbed Beanie & Scarf! Each kit provides all the yarn needed to make BOTH the beanie and matching cowl or scarf! If you are interested in some extra cozy statement scarves, I have my Jumbo Alpaca Crochet Scarf & Simple Garter Stitch Scarf! They are sooo warm and fun to snuggle in! Some great travel projects to work on that do not require much concentration are my Star Stitch Purse & Sea Breeze Sweater! Both designs are fun to work up, and the yarns required (24/7 cotton and Fast-Track) are cool to the touch, so they are the perfect yarns for Spring and Summer with the hot weather! 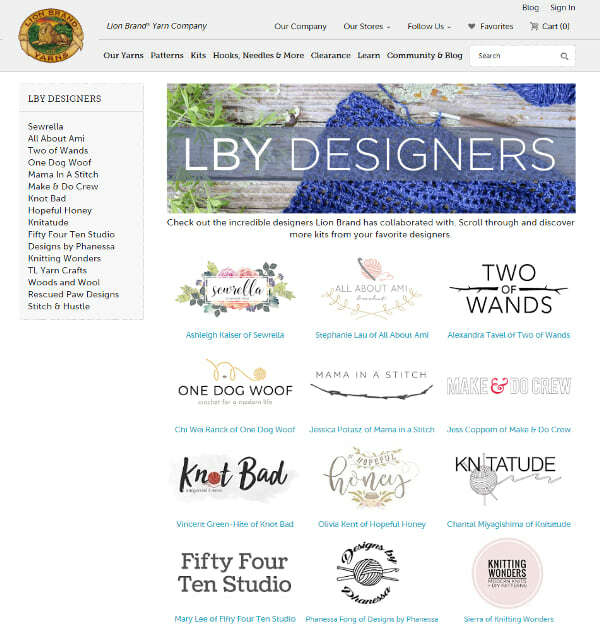 Each blogger/designer has their own landing page, and you can find the page of LBY Designers by hovering your mouse over “Kits” and then click “Shop by Designer” from the drop-down menu. I am honoured to be in such great company- check out this page HERE! I am thrilled that Lion Brand Yarn and I are partnering together for a GIVEAWAY [NOW CLOSED]! One reader will win ANY ALL ABOUT AMI KIT of their choice! 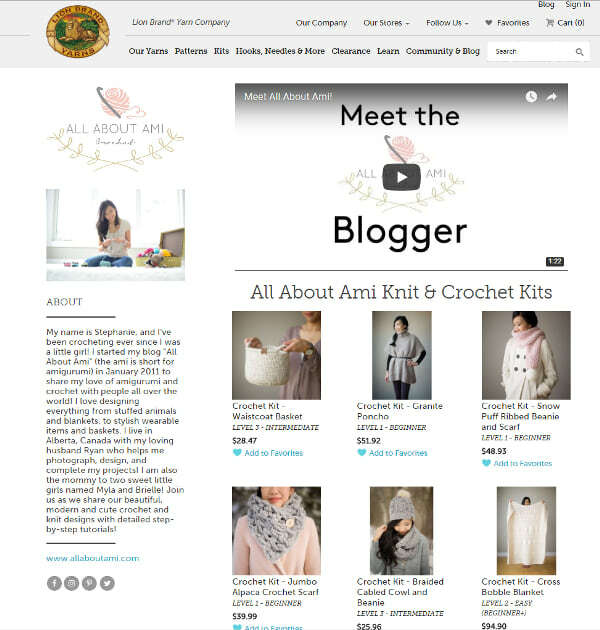 ***To enter, please visit the All About Ami Knit & Crochet Kits page HERE! Look through all of the designs and leave a comment below stating what All About Ami Kit you would love to win! This giveaway is open to residents of the US & Canada and will close on Sunday, April 22 at 8 PM MST! You can also enter through Instagram and Facebook for more chances! Note: Thank you to Lion Brand Yarn for sponsoring this giveaway! All kit links are affiliate links that allow me to make commission at no extra cost to you! Thank you for supporting my work and designs!